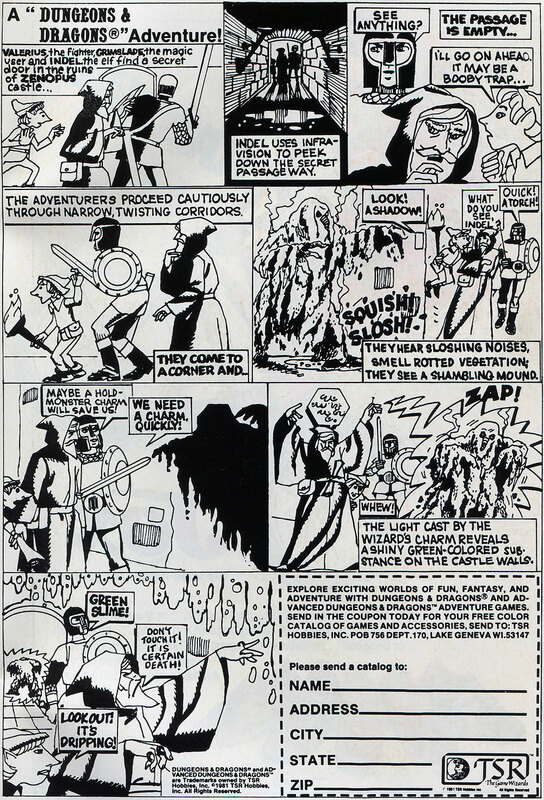 Here is a Dungeons & Dragons advertisement that ran in comic books in mid-1981. The lack of color, amateur artwork, inconsistent lettering, and ridiculous scripting is appalling. This ad is simply terrible. With that said.. I LOVE IT! This pathetic little ad inspired me to try roleplaying and seek out further comic adventures of these heroes. Sometimes greatness comes from humble beginnings. Click the image to enlarge. This ad is spectacularly bad. I love it so. I’m pretty sure that I’ve played in D&D games that were worse than the adventure in this ad, though, especially in my middle school years. Ahh yes, I remember this one well. As embarrassing as the artwork was, it wasn’t a whole lot worse than the art in the D&D books themselves. I just came across this same ad in color! Check out Das Ubernerd for the color version and all the D&D ads. Fast Fun Fact: Bill Willingham did a lot of the art for those TSR D&D ads. Fast Fun Fact: Here’s one right here! I believe I just got Fast-Fun-Fact-served. I really like the art in this ad–its so crude and basic its kinda cool. B.W. did pages 3 to 8 of this strip. Then he did another 4 pages strip and again a 2 pages ones (unfinished story).